The sunny village St. Gertraud at the head of the valley of Ulten is embedded in idyllic woods and meadows, surrounded by high mountains and characterized by lovely, weather-beaten wooden houses. It is hardly surprising that here nature lovers, jocks and people in search of tranquillity come together. Admittedly, if you would like to reach the highest village of Ulten at more than 1,500 meters above sea level, you have to accept the quite long journey through almost the whole valley. But if you would like to spend your well-earned holidays in the middle of pristine nature, far away from the hustle and bustle of everyday life, it will be well worth it. Before you get to the village centre of St. Gertraud you have the opportunity to get to know a speciality of Ulten, which is well-known far beyond the boundaries of the valley: the ancient larches. Legend has it that they are more than 2,000 years old. Due to their rotting wood today it isn’t possible to check this with certainty. However, they surely rank among the oldest conifers throughout Europe and their rugged bark, the up to eight meter thick trunks and the huge treetops undoubtedly verify their advanced age. A widely visible little church sits enthroned above St. Gertraud and its scattered old and new houses. Further works of art or buildings made by human hand are hard to find. But it doesn’t matter, because the main attraction is the nature anyway. 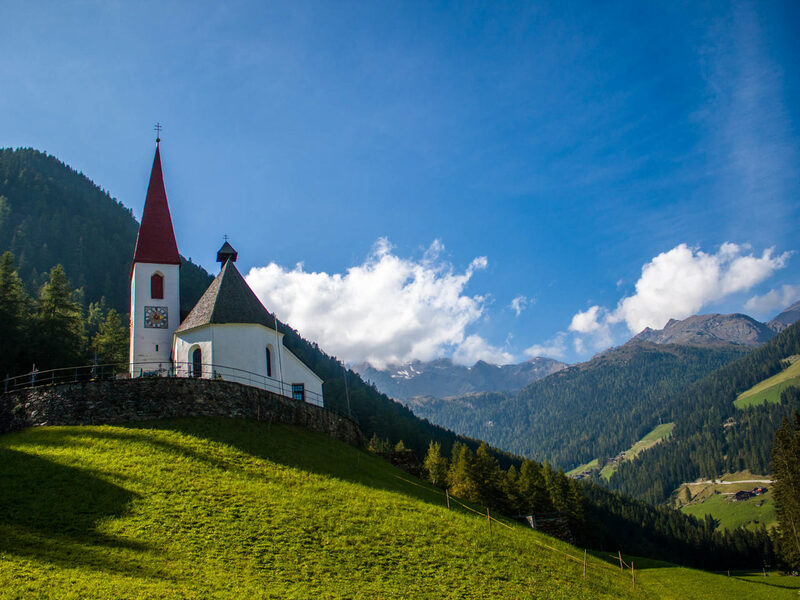 Not for nothing St. Gertraud is located in the middle of a marvellous mountain and nature landscape, which has hardly changed with the passing of the years. A popular destination for mountaineers and ambitious mountain bikers is for instance the tranquil valley of Kirchberg, branching of to the south and leading to the mountain pass Rabbi Joch. Probably a little bit more famous is the area around Lake Weißbrunn located further at the head of the valley. 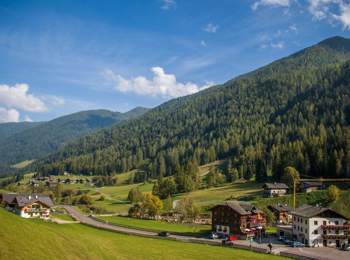 It is a good starting point for many tours in the nearby national park Stilfser Joch. 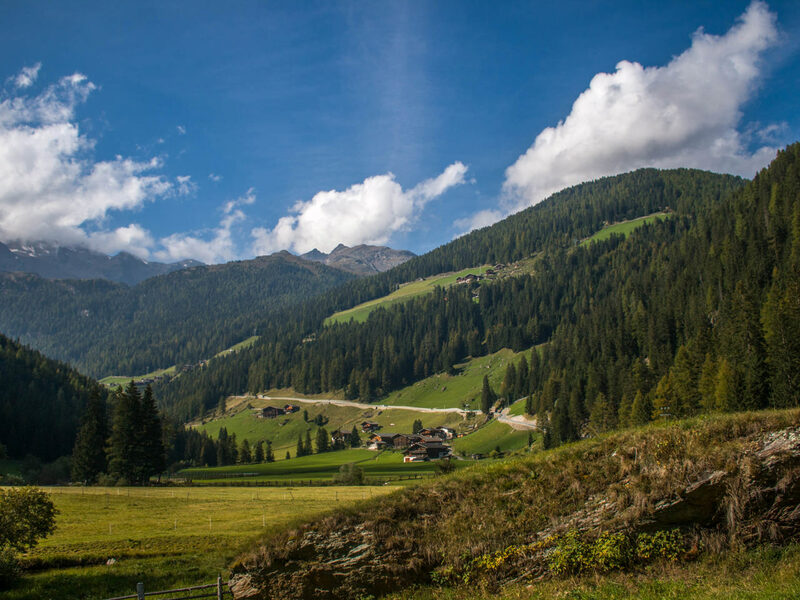 There, hikers and nature fans come together in order to discover idyllic mountain likes, extensive alpine meadows and the mighty, partly more than 3,000 meter high mountains. Worth knowing info about the national park and the topic “forest and farms” is also provided by the national park house “Lahner Säge” housed in the premises of a centuries-old sawmill. In the course of the renovation there was restored also the old Venetian saw, so that today it is again in full working order – as well as the neighbouring mill for grinding grain.